Self-contained luxury. HALF HOUSE with gardens. 2 bedrooms (Queen and Queen + Single beds) with 2 en-suite bathrooms (large shower/ shower + deep bath), well-equipped kitchenette, private verandahs, laundry, BBQ entertaining space opening to the garden. Sea glimpses, farm and bush views and sea breezes. One hectare of gardens with a lily pond dam and an 1880's train carriage. 2km to the beach. 10km to Mon Repos turtles nesting/ hatching (Nov to March). Day boat trips to the reef from Marina (20mins) eg 'Lady Musgrave Experience'. Day flights to the reef from Bundy airport (20mins) to Lady Elliott Island. Multiple swimming beaches to choose. Lavender farm nearby. Strawberry farms eg 'Tinnaberries' 3km (winter/spring) and cafes... Nearest bakery cafe is only 2km away, open 7 days. 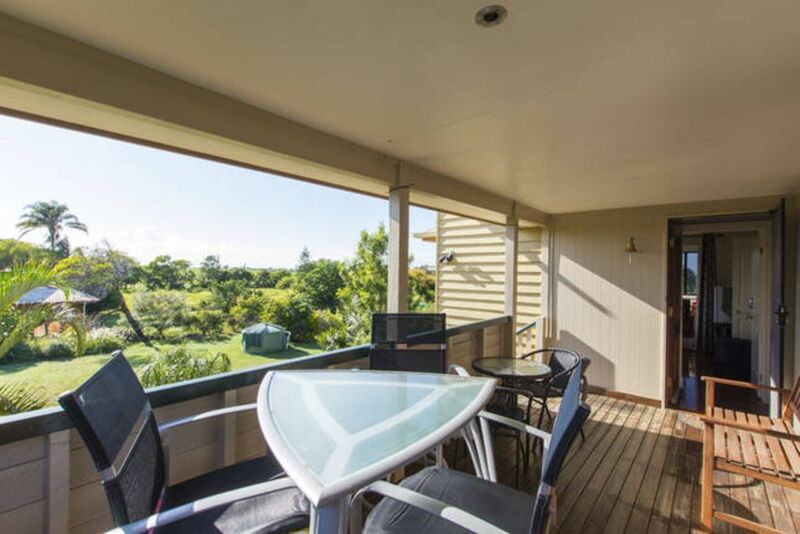 3 golf clubs nearby - 1km to Innes Park Country Club, 7km to Coral Cove Golf Club or 8km to Bargara Golf Club and other clubs/pubs/ restaurants. 14km to Bundaberg. 'Seabreeze Sojourn' is a circa 1890's Queenslander HIGHSET house that has been rescued, re-sited and restored with classic, elegant style and modern comfort. The house is characterised by high ceilings, picture rails and french doors opening onto multiple verandahs. Bedrooms have aircon, tv/dvd, wifi. Very comfy beds and pillow choices. Guest Kitchenette has dishwasher, microwave and hotplates. Basic breakfast foods and various pantry items already stocked including a few eggs laid by our chooks. Downstairs/ underneath the house: cool, paved entertaining area with gas pizza oven and BBQ. Wifi and choices of desks/chairs both upstairs and down. 'Seabreeze Sojourn' is divided in two with the owners, Catherine and Paul, residing in one half - we will empty rubbish daily and are on hand if you need anything but won't intrude on your privacy. Guests have their own private entrance, own kitchenette, own laundry. Electronic locks so no need for keys. 'Seabreeze Sojourn' is not a wedding venue however the house, gardens and train carriage have been used for photos and the spacious bedrooms with 2 bathrooms, 2 verandahs and air con make ideal dressing spaces for weddings. Catherine and Paul have lived in this house for about 10 years - finishing the house and extensive planting of the garden. We've lived out west; up north; in big cities for years and in the Torres Strait for 2 years before choosing this beautiful part of the coast. We deliberately chose Innes Park from the whole of Australia for the equitable climate and sea breezes. The original house was built in Windermere Rd and then whiteant-eaten, rescued, moved to Innes Park Rd and re-configured and restored by someone else and then we've done a lot of the finishing, walls, windows, paving, paths, solar power etc and planting thousands of plants. The highset Queenslander house has 19th Century style - high ceilings, polished floors, french doors opening onto multiple verandahs - and 21st Century comfort - new bathrooms and kitchens, wifi etc. The house locks in two halves so guests have complete privacy and their own entrance to the east. 2km to nearest beach and many swimming beaches to choose. Day trips to reef by air or sea. Turtles nesting at Mon Repos (Nov to March). Nearby suitable for snorkeling - Barolin & Hoffman Rocks. One hectare of gardens with lily-pond dam. Bushland and farm land across the road. Sea glimpses, farm and bushland views. Medium fridge in upstairs kitchenette. Small fridge in one bedroom. Large fridge that dispenses filtered water and ice in downstairs entertainment area. Electric cook top appliance or BBQ wok burner. Kitchenette seats 2 to 3 persons. Verandah has large table for 4 to 6 persons. Entertainment area has many table options. Each bedroom also has a small table and 2 chairs. We had 2 en-suite rooms which were just beautiful. Every possible need is there and a great breakfast. Catherine and Paul were very obliging hosts and made our stay, along with friends from Sweden,very relaxing. Rooms were clean and beds very comfortable. Loved our stay! We were a couple and a single staying in the area for work. Great to have the privacy of our own rooms with ensuite whilst still having some common areas to share breakfast and dinner. Catherine was a great host and was available when we needed. Great goodies in the kitchen for us to enjoy. Next time I hope to stay for pleasure and take full advantage of bbq area and bath! Wonderfull host. Really feeling like at home. Confortable avec un petit air rétro bien agréable. We higly recommend. We stayed for 2 days nights..
Want to stay again as accommodation was perfect. There was everything we needed was supplied and more. Hosts were very friendly and hospitable. They were not intrusive but available when required. Thanks Susie and friends. Loved having you stay. Quiet, clean, everything you need. The hosts are lovely, very welcoming, it's a home away from home. You are welcome, thank you. Glad you enjoyed the time out in the garden and the neighbourhood - including the Bundaberg Zoo, which takes a good half hour, ha ha - but at least it is FREE, no queues and the animals are cute! 15 minutes east of Bundaberg. Handy location for visiting the turtles at night at Mon Repos (Nov to March) (11km) or the Marina for Lady Musgrave Island day reef tour or the airport if going to Lady Elliott Island.